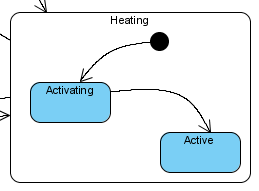 How to Draw State Machine Diagram? 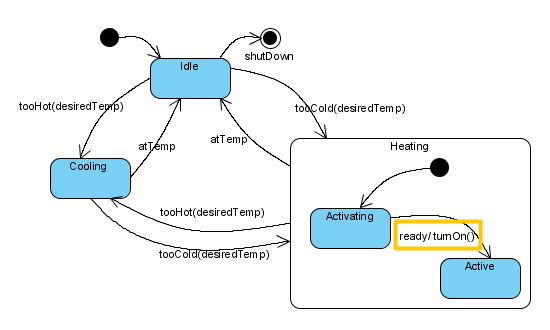 State machine diagram is a kind of UML diagram that shows flow of control from state to state within single object. It usually contains simple states, composite states, composite states, transitions, events and actions. Perform the steps below to create a UML state machine diagram in Visual Paradigm. 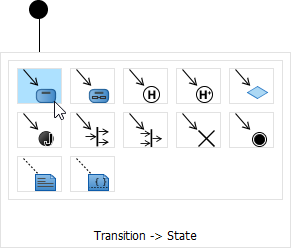 In the New Diagram window, select State Machine Diagram. Move your mouse pointer over the source state. Press on the Resource Catalog button and drag it out. Release the mouse button at the place where you want the state to be created. Select the state to be created from Resource Catalog. A new state will be created and is transited from the source state. Enter its name and press Enter to confirm editing. To model substates of a composite state, you need to add one or more regions to it. To add a region, right-click the state and select Add Horizontal Region from the popup menu. Next, you can draw the substates inside the region. To model properties of transition such as effect and guard, right-click the transition and select Open Specification... from the pop-up menu. When the Transition Specification pops out, you can edit its name, effect and guard. Next, select Create Activity... from the Effect property. 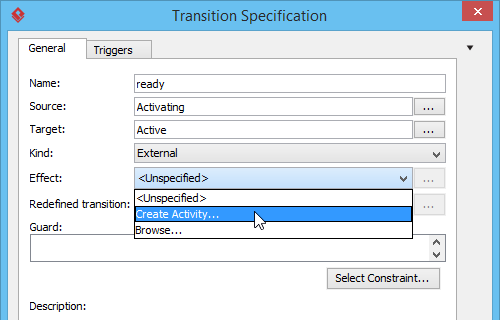 In Activity Specification (Effect) window, change its name and then click OK button to apply the change. Click OK in the Transition Specification to close it. The name and effect are shown on the transition caption.